Stakich Bee Pollen Granules are premium quality and all natural with absolutely NO additives – all of its enzymes are kept intact, providing you with a rich source of vitamins, especially B12 and E, minerals, and amino acids. It has a mildly sweet and floral taste that You’ll add to smoothies, cereals, yogurts, or any of your favorite everyday foods. Store in a cool, dry place, away from direct sunlight. Refrigeration is optional. 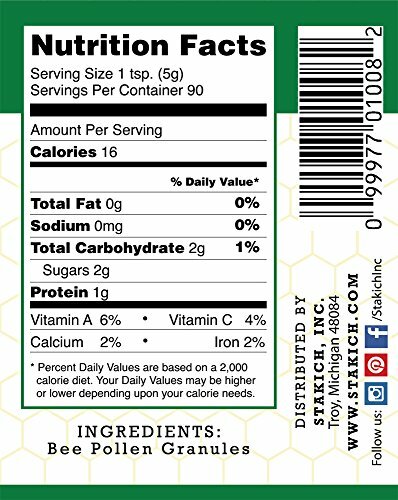 Bee products must not be fed to infants under one year of age. Stakich Incorporated was started over 90 years ago with one goal: that can assist you live a healthy lifestyle with all natural, prime quality products at a price You’ll have the funds for. That mission has led us to strive for perfection with the products we sell and the excellent customer service we provide. Family owned and operated from the start, at Stakich Inc. we regularly look for how one can make you healthier by providing only the finest ingredients in all the products we offer! 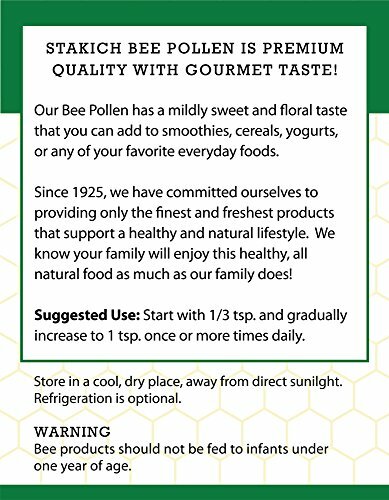 Check out our additional Amazon listings for plenty of Enriched Raw Honey products, Bee Pollen, Royal Jelly, Beeswax, Chlorella, Spirulina, Ginseng, and over 100 Herbal Extracts.